Instant mounting hum-canceling soundhole pickup that gives you warm, full sounding acoustic tone. The Woody HC is a passive, noiseless, magnetic soundhole pickup that delivers a warm, rich acoustic tone that is great for all types of acoustic playing. It is a hum-cancelling design delivers a fatter, more compressed sound than the SC (single coil) version. All of the Woodys are available in our custom maple, walnut or black stained housing, and are double potted to keep them resistant to feedback. 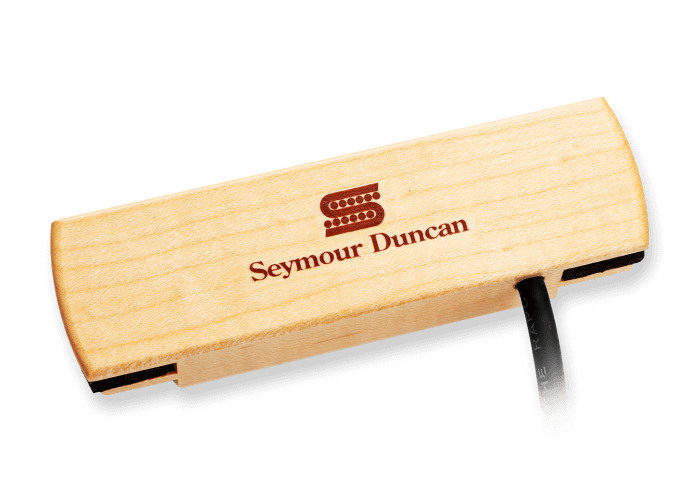 It mounts instantly into your soundhole, with no modification of any kind needed to the guitar and can easily be removed at a moments notice. It comes with a 14-foot low capacitance, studio quality cable that will plug directly into your favorite amp, PA, direct box, or console. Fits all standard soundholes (3.75 (94mm) to 4.0 (100mm). Great for all standard types of steel string acoustic guitars. NOTE this is a magnetic pickup, and will not work with nylon stringed instruments.